We look at price, CPU, graphics, the display, and more. Updated Oct. 31, 2017 with additional data on the Surface Laptop, including updated color options and a Core i7 with a 1TB SSD. Microsoft's Surface Laptop is aimed at supplanting the MacBook Air as a college-student favorite. The svelte, stylish clamshell also fills a middle ground between its cousins, the Surface Pro 4 tablet and Surface Book powerhouse 2-in-1, providing a third option that could appeal to many regular consumers. We got a good first impression of the Surface Laptop after going hands-on in advance of its June launch. Now that we've reviewed it, we can help you decide whether it's a better choice than the Surface Pro 4, with its promise of a tablet that can be a full-fledged computer. Let’s dig in! 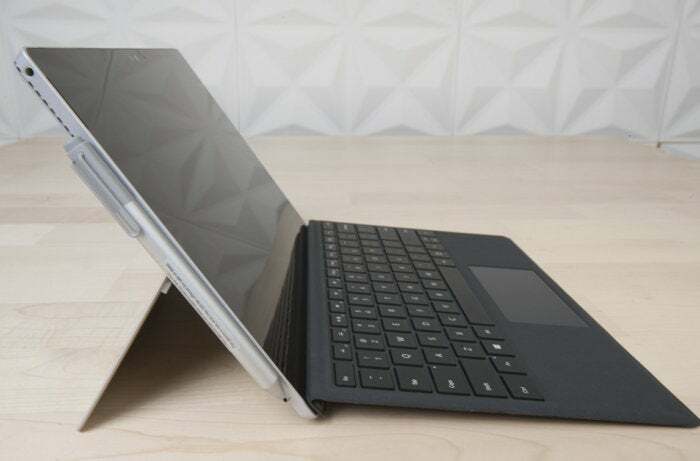 You really need to add a Type Cover keyboard to your Surface Pro 4 purchase. NOTE: As of October 31, 2017, Microsoft has added a version of the Surface Laptop, with a Core i7, 16GB of RAM and a 1TB SSD, for $2,699. Neither the Surface Pro 4 nor the Surface Laptop is especially cheap, as the prices above indicate. Selecting the right Surface Laptop comes with a caveat: It's aimed at education, where you’ll be subject to the whims of professors who dictate what software to buy. The entry-level models with 4GB of RAM may struggle if burdened with demanding applications. The models with 8GB of RAM or more will have better staying power. Buying a Surface Pro 4 is a bit more straightforward. Note that these prices do not include a Type Cover attachable keyboard, which costs an additional $130 to $160 depending on the model. While you could theoretically do without one, you’ll make your life a lot easier if you add a Type Cover to your shopping list. While asking college students to pay north of $1,500 for a higher-end Surface Laptop seems unrealistic, even if the alternative is an equally pricey MacBook Air, the most viable comparison is between the Surface Laptop with Core i7/8GB RAM/256GB SSD ($1,599) and the near-identically configured $1,349 Surface Pro 4 plus Type Cover (for a total of $1,479-$1,509). Note that the Surface Laptop offers a more advanced 7th-generation (Kaby Lake) Intel Core processor, while the Surface Pro 4 is stuck with the 6th-generation (Skylake) chip. We’ve summarized the chief features of the Surface Pro 4 and Surface Laptop here. To compare weights fairly, we’ve taken the liberty of adding a regular Type Cover (0.68 pound) to the Surface Pro 4's equation. (Note the Type Cover is also a tiny bit larger than the SP4’s dimensions stated above, to protect the Surface Pro 4’s screen.) Though very light at 2.76 pounds, the Surface Laptop is still larger and heavier than the Surface Pro 4. 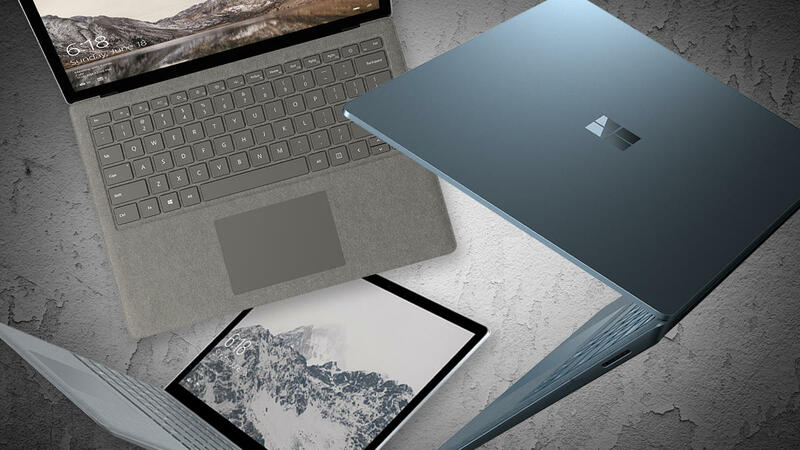 While the older Surface Pro 4 is manufactured out of magnesium, Microsoft returned to aluminum with the Surface Laptop. 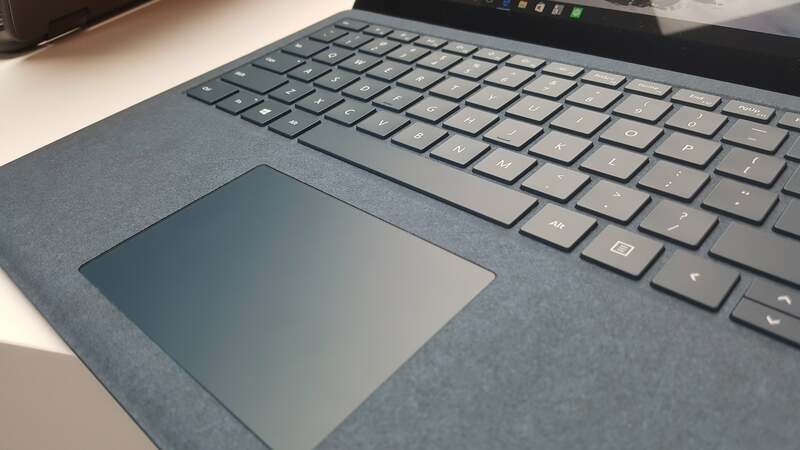 In one regard, though, both devices are nearly identical: The Surface Pro 4’s Signature Type Cover is made of Alcantara fabric over a plastic base, while the Surface Laptop's Alcantara keyboard cover is joined to the aluminum chassis with a nearly invisible seam. The Surface Pro 4 ships in just one color, but a variety of Type Covers allow you to customize it (more on that below.) 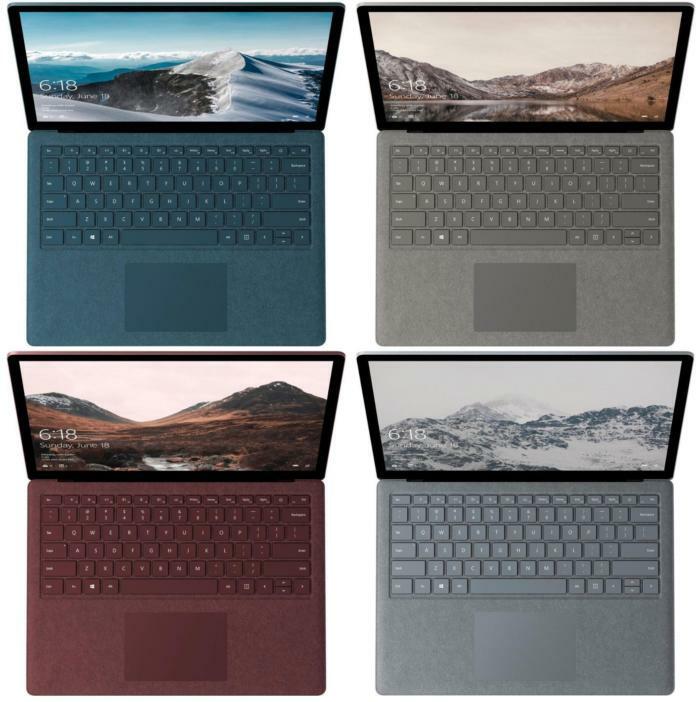 The Surface Laptop, meanwhile, allows you to select one of four colored Alcantara fabrics: cobalt blue, platinum, burgundy, and graphite gold. The four colors of the Surface Laptop. Because the Surface Pro 4 is a traditional 2-in-1, it lacks a traditional hinge. Instead, a magnetic strip runs the length of the Type Cover, folding back over itself to allow the keyboard to lie at a slight angle. 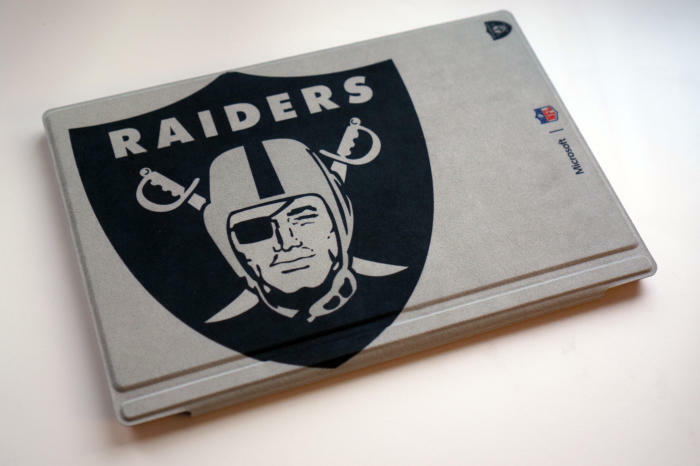 A pop-out kickstand panel supports the tablet from the rear, allowing it to recline from 90 degrees to about 15 degrees. Don’t think for a second, though, of holding the Surface Pro 4 by the Type Cover. If you do so, or forget to support the tablet with the kickstand, it will flop over and rip free of its magnetic restraints. 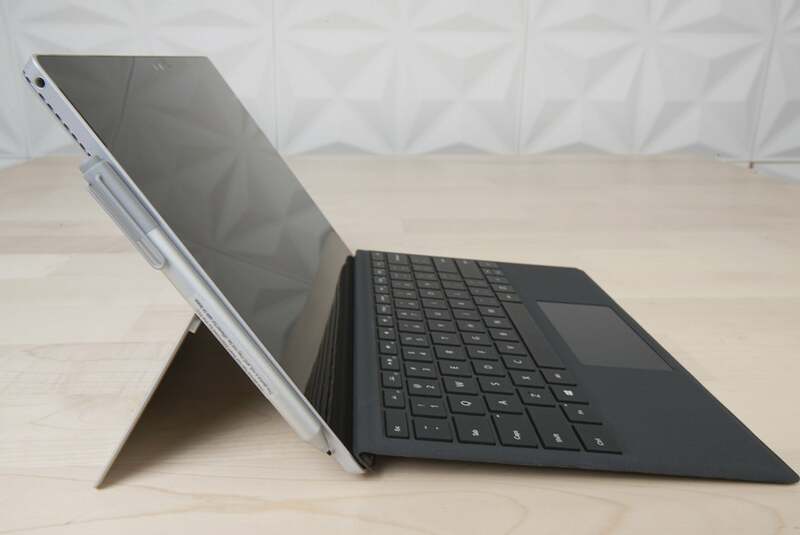 The Surface Pro 4 requires a kickstand to support it as it reclines; the Surface Laptop does not. The Surface Laptop has enough structural integrity that you can wave the Laptop around by the base, and it will recline to about 60 degrees without the need for external kickstand support. Unlike convertible laptops, though, the Surface Laptop lacks a 360-degree hinge. While Microsoft made the hinge an important design element of the chunkier Surface Book, the Laptop’s hinge is virtually invisible unless you open the device and squint. Of course, there's one advantage the Laptop boasts, and that's "lapability:" it feels natural and comfortable while on your lap. You can use the Surface Pro 4 on your lap in a pinch, though it's just not in the same league as a traditional notebook like the Laptop. The most confusing aspect of the Surface Laptop for most people is its operating system. While the Surface Pro 4 ships with Windows 10 Pro, the Surface Laptop is the first Microsoft device to come with Windows 10 S, a version of Windows 10 designed for educational institutions. 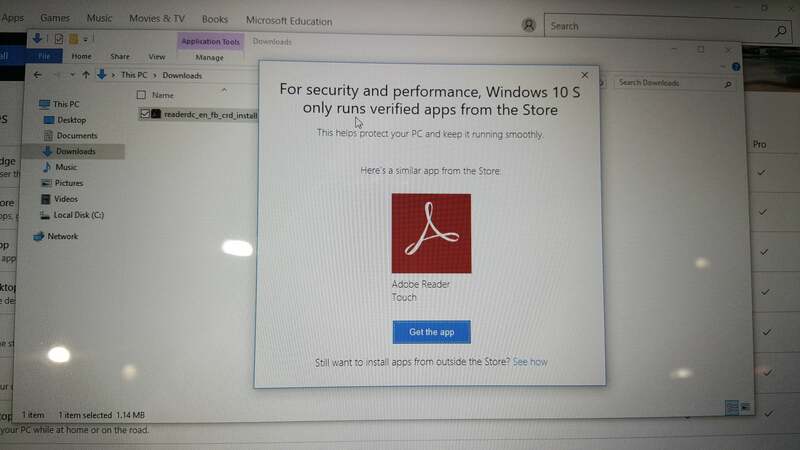 To ensure greater manageability for school IT administrators, Windows 10 S machine can run only apps—both UWP and Win32—that are sold via the Windows Store. You're also restricted to Bing for search, and Edge for web browsing. If you try to load an unapproved app into Windows 10 S, you'll see this popup. Windows 10 S does allow you to upgrade to Windows 10 Pro, however, right from the Windows Store. From now until the end of 2017, that upgrade is free; after that, Microsoft may charge you $49 for the privilege. The Laptop uses a more modern 7th-generation (Kaby Lake) Intel Core chip, specifically the 2.5-GHz Core i5-7200U, versus the 6th-generation (Skylake) 2.4-GHz Core i5-6300U found inside the Surface Pro 4. 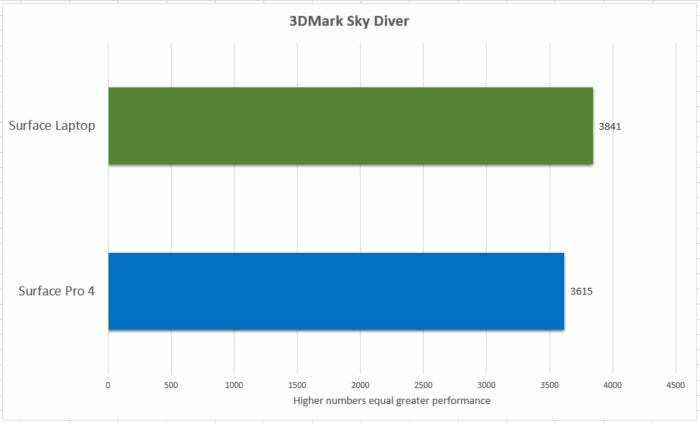 Based on our CPU tests, Kaby Lake gives a small advantage—but still a plus. 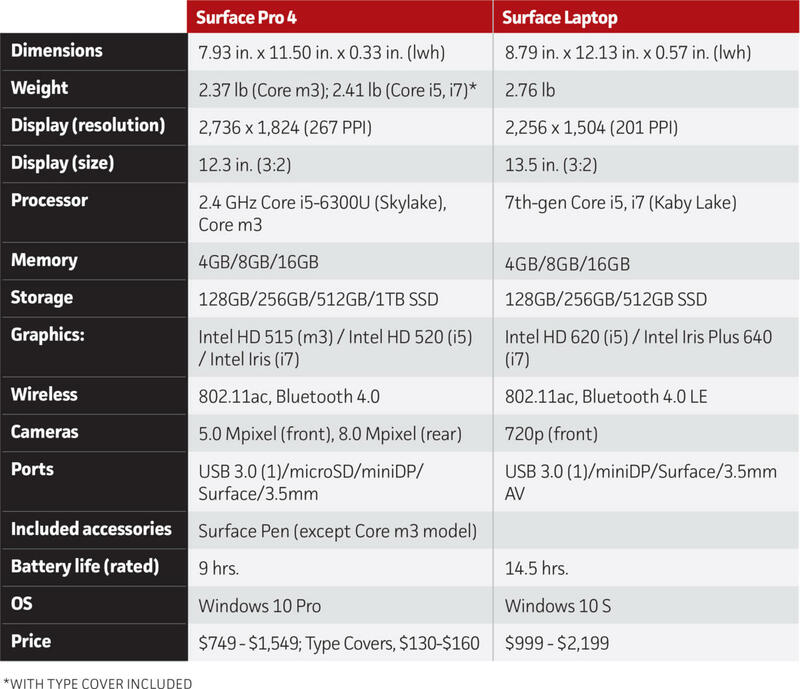 If you want to save some money, consider the Surface Pro 4 and its Core m options. 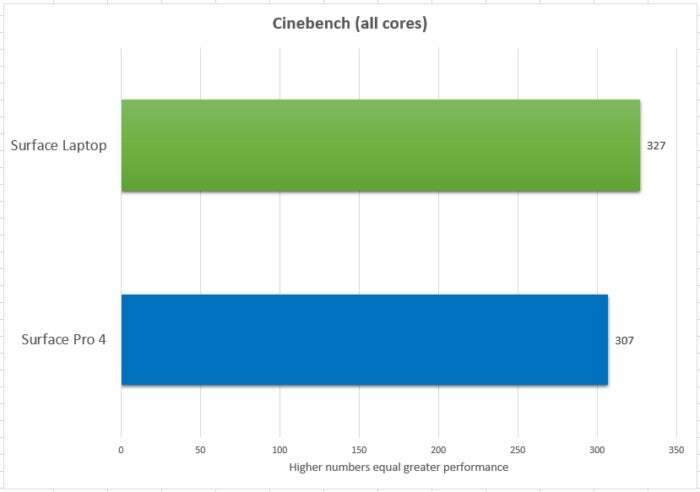 Intel’s Core m may be slower than a full-fledged Core chip, but it provides sufficient performance for mainstream tasks. Do keep in mind, though, that the lower-end offerings of both the Surface Laptop and Surface Pro 4 ship with 4GB of memory, which can be a bit painful to use with demanding applications or stacks of browser tabs. Like the CPU, the Surface Laptop’s updated components simply give it an advantage. I was honestly a little amazed that I could play some decently graphics-intensive games on the Surface Pro 4. The Surface Laptop’s HD 620 and HD Iris Plus 640 chips are the next iteration above the Intel HD 520 and Iris integrated graphics found in the Surface Pro 4. Neither machine offers a discrete graphics option, though, so your performance will be somewhat limited compared to, say, the Surface Book. Both the Surface Laptop ad Surface Pro 4 use Microsoft’s PixelSense IPS technology, offering 10-point multitouch displays. Both screens have the same 3:2 aspect ratio, too. Beyond that, they head in different directions. The Surface Pro 4 features a superior, if somewhat smaller, display. The Surface Pro 4’s 12.3-inch display is small, but its 2,736x1,824 resolution looks very sharp. If you favor larger displays and can tolerate some compromise in resolution, choose the Surface Laptop. Its 13.5-inch screen has a resolution of 2,256x1,504 (201 PPI)—somewhat fewer pixels than the Surface Pro 4's, spread across a wider field. One of my strongest first impressions of the Surface Laptop was that its keyboard was a stiffened, rigid version of the Surface Pro 4’s Signature Type Cover: same touchpad, same keys, same Alcantara fabric. They’re both very good, though not quite as good as a traditional laptop's keyboard, or the Surface Book's. 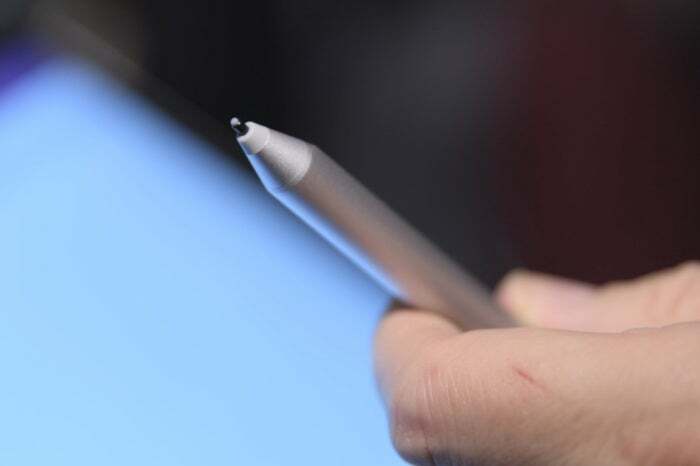 Of the two, only the Surface Pro 4 ships with a Surface Pen. Nevertheless, the keyboard is where buyers of each device will be able to express their personality. When you buy a particular color of Surface Laptop, you’re choosing the particular Alcantara fabric on the keyboard. Likewise, Surface Pro 4 buyers have a choice of the traditional $130 Type Cover (in bright blue, blue, black, red, and teal); a $160 black Type Cover with an integrated fingerprint reader for additional Windows Hello functionality; the Alcantara-covered $160 Signature Type Cover; and finally, a line of $160 NFL Type Covers emblazoned with the logo of your favorite team. Only the Surface Pro 4 allows football fans to show their true colors. Both devices support the Surface Pen as well as the Surface Dial peripheral (though not the Dial directly onscreen). But only the Surface Pro 4 ships with the Surface Pen; it's a $60 option with the Surface Laptop. The Surface Pen offers 1,024 levels of pressure and is available with a Pen Tip Kit ($20) that offers a few tip options. Inside is a AAAA battery, good for about a year’s worth of use. The Surface Laptop’s single 720p front-facing camera was designed for students who don’t especially care how they look while chatting with one another. The Surface Pro 4’s front-facing 1080p 5MP camera places a bit more emphasis on professional Skype calls. The Surface Pro 4 also includes an 8MP rear camera to compete with the hordes of iPad owners who inexplicably choose to take digital pictures with a tablet. Under the Surface Laptop keyboard hides a pair of Dolby Audio Premium-specced speakers. While the Surface Pro 4’s speakers are behind the tablet display (after frequent use, the right speaker on my unit is inoperable) the Surface Laptop puts its “omnisonic” speakers directly under the keyboard's Alcantara fabric. They offer a decided volume advantage over the Surface Pro 4, with a richer audio experience. I tend to use tablets and laptops on a keyboard drawer, and the Laptop's omnisonic speakers delivered a pleasing, slight reverb effect while playing back tracks with a strong bass line. While audiophiles will probably turn up their noses at both machines, the Laptop has a clear advantage here. I always thought that the Surface Pro 4’s choice of a single USB 3.0 Type A port on the side of the display was sufficient, especially when connected to the $200 Surface Dock, which adds an additional four connectors. But two years on, the Surface Pro 4’s port contingent (1 USB 3.0, microSD slot, miniDisplayPort, 3.5-mm headset jack, and Surface Connector) looks a little slim. The world’s moving on to USB-C. Unfortunately, that same argument can be leveled at the Surface Laptop, which also has but a single USB 3.0 Type A port, along with miniDP, 3.5mm headset jack. and Surface Connector. It ditched the SD card slot for cost savings. Both devices use 802.11ac for wireless connectivity, as well as Bluetooth. The Laptop uses the slightly more advanced Bluetooth 4.0 LE. 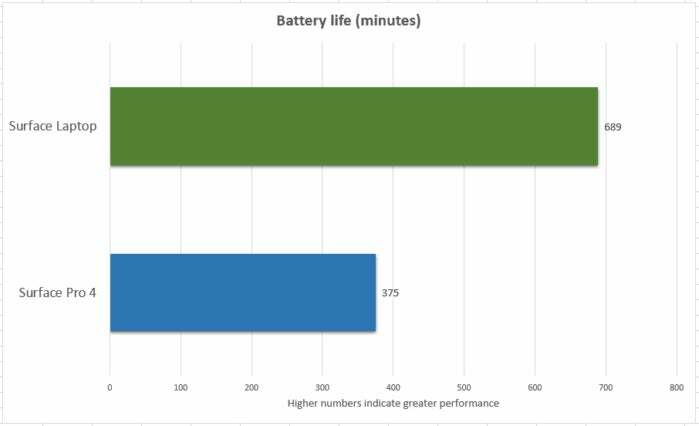 Microsoft's promise of 14.5 hours (in video playback) for the Surface Laptop’s battery life far exceeds the 9 hours of the Surface Pro 4. That longevity is thanks, in part, to the additional battery cells mounted behind the Surface Laptop’s display. 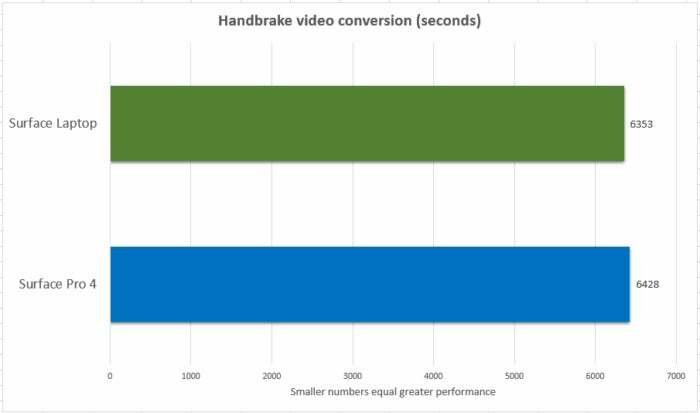 Here are the results for each product based on our own video rundown tests. If battery life is a factor in your decision—and it should be—than the Surface Laptop clearly wins. If you're looking for a clear indicator of which device to buy, our performance benchmarks should provide it. The Surface Pro 4 simply can't keep up with the Laptop in nearly all areas. Consider the PCMark benchmarks, which measure everything from general office-suite performance (Work) to light browsing and photo editing (Home) to more intensive photo and video editing, plus more intensive gaming (Creative). Here, the Surface Laptop has the clear edge. If you move on to the Cinebench benchmark, which stresses all of the processor cores and threads by rendering a 2D, computer-generated image, the Laptop comes out on top again, but by a narrower margin, showing how close the Skylake and Kaby Lake chips are in terms of performance. Ditto for the Handbrake benchmark, which takes an open-source video transcoding tool and applies it to a top-tier Hollywood movie that we convert for use with an Android tablet. Again, there's hardly any difference—less than a minute. Normally, if you were to look at graphics capabilities, you'd want to buy something like the Surface Book versus either the Surface Laptop or the Surface Pro 4. Both the Surface Laptop and the Surface Pro 4 use integrated graphics, though, leaving both capable of playing some older games, though not AAA titles at high settings. As we noted above, the real differentiator is battery lifel You may opt for the svelte thinness of a tablet, but the Surface Laptop provides truly all-day battery life. 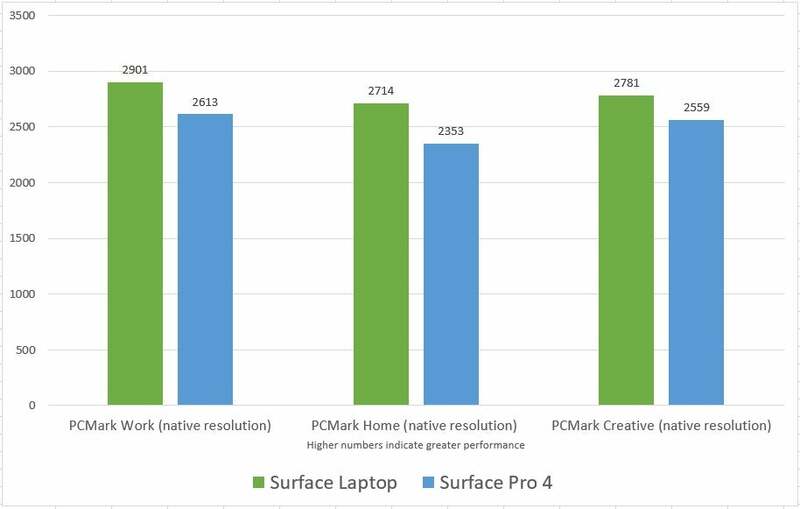 The Surface Pro 4 is nowhere close. It depends on how you slice it, but the Surface Laptop weights just six ounces more, and (with the Core i5/4GB/128GB model) costs an additional $150 in price. If you're not a heavy tablet user, that helps justify the price of the newer Surface Laptop and its vast improvements in battery life. In the meantime, Microsoft has launched the revamped Surface Pro, an updated version of the Surface Pro 4. We'll run down the differences between the new Pro and the Surface Laptop soon. As it is, the Surface Pro 4 is still a quality machine, with few obvious flaws. Assuming you take advantage of the free upgrade to Windows 10 Pro, however, the Surface Laptop starts to look more appealing. A more modern processor and additional battery life start to justify the cost. Between the Surface Laptop and the Surface Pro 4, choose the Laptop. It's the better bet. Bang for buck isn't Microsoft's priority with these flagships, however, so value-seekers should cast a wider net. A comparison of the Surface Laptop against the Dell XPS 13 and HP Spectre x360 shows you some very competitive options.